I have been a fan of Disney my whole life. I started visiting Disney World when I was four years old and I frequently visited while growing up. When my husband and I got married we traveled to Disneyland Paris during our honeymoon. Now that we have four children of our own we try to visit Disney World several times each year. As a family we are huge fans of the Run Disney events. We run the 5k races as a family – even my 5-year-old daughter has finished a 5k there. The races are fantastic and perfect for all ages. 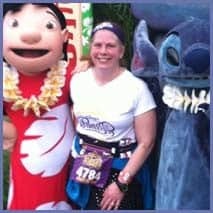 This year I plan to run in almost every Run Disney event including the Princess Half Marathon, Tower of Terror 10 mile, Wine and Dine Half Marathon and the Goofy Challenge in January. I would love to talk to you about the Run Disney events. I am also a big foodie. Disney has so many different dining opportunities that can make your vacation more magical. I would love to help you plan your advance dining reservations. Pixie vacations planners are there to help you with every detail of your vacation planning. From making your dining reservations to helping you plan your itinerary I will be there every step of the way. I will even monitor your reservations for discounts. Best of all, you pay nothing for these services so you will have a magical vacation without all of the planning hassles.